What is Posterior Cruciate Ligament Injuries? PCL injuries are very rare and are difficult to detect than other knee ligament injuries. Cartilage injuries, bone bruises, and ligament injuries often occur in combination with PCL injuries. Injuries to the PCL can be graded as I, II or III depending on the severity of injury. 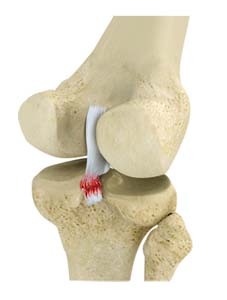 In grade I, the ligament is mildly damaged and slightly stretched, but the knee joint is stable. In grade II, there is partial tear of the ligament. In grade III, there is complete tear of the ligament, and the ligament is divided into two halves making the knee joint unstable. The outcome of the treatment is dependent on age factor. Younger children may develop arthritis symptoms later in their life if surgical treatment is not given. In adults, surgery involves PCL reconstruction; however, in children, this surgery is still under controversy because of a risk of developing physeal (growth plate) injury. Growth plate also called as the epiphyseal plate or physis is the area of growing tissue made up of cartilage (rubbery material) found at the ends of the long bones in children.